Yu-Gi-Oh! 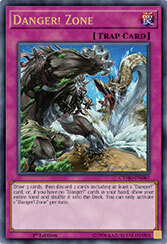 TCG Strategy Articles » Discover a Hidden World, Full of Danger! Home > Special, What's New? > Discover a Hidden World, Full of Danger! Discover a Hidden World, Full of Danger! Cryptids are elusive monsters that everybody’s heard of, but few have ever seen. Imagine if a secretive force took the world’s most mysterious monsters and transplanted them to an island of tropical terrors. Now throw in some hunters seeking the World’s Most Dangerous Game for their Ultimate Fantasy Big Game Safari — but who’s the hunter, and who’s the hunted? If you tuned in to the North American World Championship Qualifier this past weekend, then you know the secret is out: Bigfoot is real, Nessie too, and they’re in Cybernetic Horizon! These Special Summon effects are both strong, and thrilling to play with. Depending on the size of your hand, the odds of successfully Summoning your monster increase or decrease. The more Danger! monsters are in your hand, the more likely your opponent won’t find the safari target, which is your best case scenario. 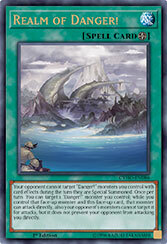 If they miss the safari target, you Special Summon it, draw a card, and get the activated effects of whatever Danger! monster your opponent made you discard instead. If they do find the safari target, you still get to activate its discard effects. So you win either way! Summoning your monsters is just one piece of the puzzle. Sneaking them past your opponent’s monsters and connecting for massive damage is the other. The mysterious Realm of Danger! makes this happen and protects your monsters from being targeted by card effects on the turn they’re Special Summoned, too! During each of your turns, Realm of Danger! can make one of your “Danger!” monsters on the field undetectable for as long as it and the Field Spell are on the field. That monster can attack directly and can’t be attacked, but doesn’t block attacks, similar to The Legendary Fisherman with Umi on the field. One strong setup involves Summoning Bigfoot in attack position and Nessie in defense position, then using Realm of Danger! on Bigfoot. With this setup, you can bypass your opponent’s monsters while defending your own Life Points and win within 3 Battle Phases. If you can land a second Bigfoot on the field, you can win in 2 instead. There’s always an element of risk involved when activating a “Danger!” monster’s effect, but if you want precise control over what you discard, and get some free draws too, check out Danger! Zone. Danger! Zone is essentially Graceful Charity. The only caveat is that one of the cards you discard has to be a “Danger!” card. All of the monsters have great effects when you discard them, but Bigfoot destroys a face-up card on the field, so it’s the obvious first choice when you’re discarding during your opponent’s turn. It’s really easy to search Danger! Zone out of your Deck. Danger! Nessie! can fetch it since it’s a “Danger!” card, and Lilith, Lady of Lament can set it directly from your Deck since it’s a Normal Trap. If you can find at least 1 more DARK monster with 0 DEF to go with Bigfoot and Lilith, it’s worth playing Recurring Nightmare to refill your hand, make it easier to Summon “Danger!” monsters, or just get more copies of Bigfoot to discard so you can mess up your opponent’s combos! One fun option is Lucent, Netherlord of Dark World since you can Special Summon it when it’s discarded to the Graveyard by a card effect. Danger! is a fun new strategy you’ll be able to get your hands on when Cybernetic Horizon launches July 27th or one day earlier on July 26th at your local Official Tournament Store! Categories: Special > What's New? Tags: Cybernetic Horizon, Danger! Order of the Spellcasters: The Mighty Master of Magic!